Dental care professionals recognise that the key component of any thorough dental hygiene appointment is patient assessment. While there are several tools used for conducting screenings and examinations for oral health, other aspects of patient health that may be related to dental heath are commonly overlooked. A patient's blood pressure is one of these parameters. Appropriate monitoring of blood pressure cannot only improve outcomes of dental care but also play a role in improving the overall health of patients. According to the American Heart Association, hypertension (blood pressure classified as 140/90 mmHg or above) is the most common primary diagnosis in the United States, affecting nearly one out of every three Americans, and it is still the leading cause of death in the United States (AHA, 2008). Hypertension is a major risk factor associated with many cardiovascular diseases and plays a significant role in the progression of congestive heart failure, stroke, heart attacks, kidney failure, and premature death. Factors that contribute to the prevalence of hypertension are smoking, stress, drugs, alcohol, nutrition, diabetes, obesity, and limited physical activity. Because hypertension has become a prevalent concomitant condition, the American Dental Association (ADA)recommends that all dental care providers need to be involved in the detection and management of hypertension. The ADA recommends that dental offices should take blood pressure on all new patients and annually on all recalls. Patients with hypertension should be monitored throughout each dental visit during which complex procedures are performed, since elevations of blood pressure can increase a patient's risk of experiencing a stroke or myocardial infarctions in the dental chair (Thompson et al., 2007; Herman et al., 2004). Several studies have shown that dental care professionals can play an important role in a patient's overall health by measuring blood pressure, potentially identifying undetected or uncontrolled hypertension, and referring individuals to their physicians when treatment is indicated (Greenberg et al., 2007; Thompson et al., 2007; Schaffer et al., 2001). Dental hygienists are in a unique position to assess blood pressure and increase a patient's awareness about the risk associated with hypertension since hygienists have regular contact with patients due to frequent care intervals. Unlike physicians, where their patients only visit them when they are ill or undergoing a diagnostic procedure, dental patients usually are not experiencing a systemic illness when visiting the dentist and usually consider themselves healthy during dental visits (Thompson et al., 2007). Therefore, dental hygienists have a great opportunity to educate their patients on the health risks associated with hypertension, recommend appropriate lifestyle modifications, and promote healthy lifestyles. Since blood pressure is a significant factor in a person's overall health, it is important to know exactly what blood pressure is. Blood pressure refers to the force exerted by circulated blood on the blood vessels. A blood pressure measurement is reported as the systolic pressure over the diastolic pressure in millimeters of mercury (mmHg). Systolic pressure is the peak pressure in the arteries which occurs when the heart contracts. Diastolic pressure refers to the lowest pressure in the arteries which occurs when the heart muscle is at rest between heart beats. Normal or optimal blood pressure measurements are considered to be less than 120/80 mmHg. Although blood pressure is very important to a person's health, accurately measuring blood pressure is difficult. While the mercury manometer remains the "gold standard" in blood pressure measurement (Jones et al., 2003), there are several factors that can affect the accuracy of blood pressure measurements using a manometer. These factors include untrained observers, poor quality stethoscopes, improper cuff size and placement, a deflation rate faster than 3 mmHg per second, improperly calibrated devices, and digit preference (Pickering et al, 2005). To overcome these common sources of human error, automated blood pressure monitors were developed to provide a more user-friendly and objective method for measuring blood pressure. Automated blood pressure monitors on the market today remove many sources of human error that are associated with manual blood pressure. 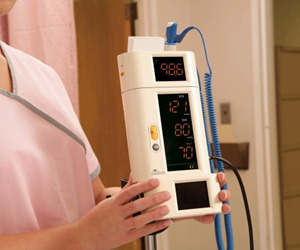 Automated monitors are easy to use, require very little training (except for proper cuff sizing and placement), and are widespread throughout most medical facilities. However, some automated devices have been notorious for their inaccuracies, since the most common automated devices on the market are non-certified devices. Automated blood pressure devices that are certified have passed the Association for the Advancement of Medical Instruments (AAMI) validation protocol or a similar standard. 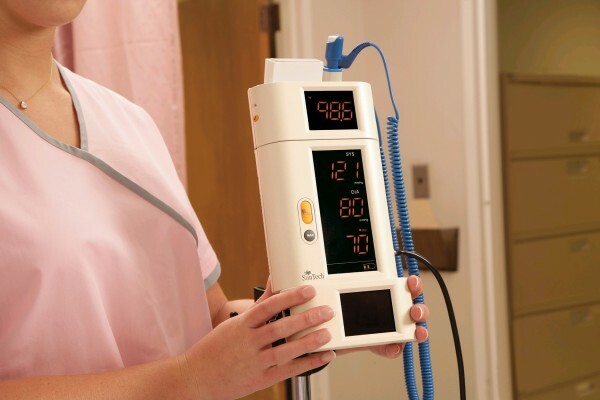 Since regulatory agencies do not require the use of AAMI-validated instruments in the health care industry, there is nothing to prevent the sale of non-certified blood pressure devices to hospital, clinics, or individuals. With a variety of validated blood pressure monitors on the market, it may be hard to decipher which monitor is most suitable for a dental office. There are three important factors to consider when purchasing a device. First, automated monitors are easier to use, eliminate common sources of human error, and will give an objective measurement across all patients. Second, an automated monitor should be validated and have passed either the AAMI protocol or similar standard. Third, it is important to have a manometer as a back up method for measuring blood pressure since there are some patient conditions (i.e. arrhythmias) and patient groups (i.e. pediatrics) where automated monitors do not function well (Jones et al, 2003). Fortunately, SunTech Medical has come up with solution to address the issues associated with both automated and manual blood pressure devices. The SunTech 247TM Diagnostic Station is a portable, fully automated, AAMI-validated, blood pressure device with the convenience of a manual back up mode that allows dental care professional to take traditional blood pressure readings with a stethoscope if desired.